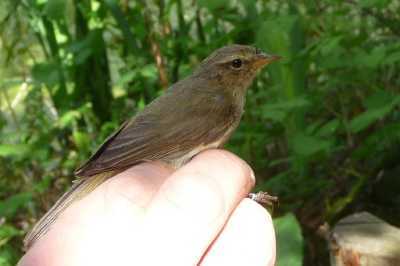 Bird-ringing specialists netted a treat when they visited Holland Park in May: a reed warbler, previously unknown in the park. Bill Haines, with two volunteers from the Aylesbury Vale Barn Owl Project, erected three mist nets in the wildlife area so that they could demonstrate bird ringing. The latter provides data on survival and movement of birds, and this enables conservationists to tackle problems. Mist nets are often used for bird ringing because they are so fine that they are invisible to birds and catch them without harming them. 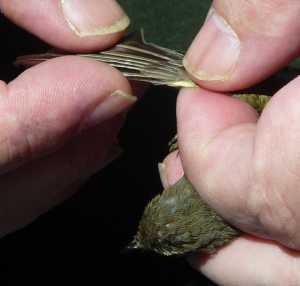 Our specialists gently removed birds from the nets, identified the species, measured and weighed each bird, then recorded the information before carefully attaching a leg ring with a unique number. Some birds caught on the day already had rings, making it possible to trace from records where and when they had previously been netted. People who dropped in to watch the ringing, which was sponsored by The Friends of Holland Park, had the chance of seeing a chiffchaff, male and female blackcaps, a robin, two blackbirds (who were squabbling hard when the net caught them), one very cross jay and a number of other birds not witnessed by me. But the reed warbler was the real prize. On a rare sunny morning, Dr Alan Harrington led fifteen keen students on a walk to examine the conifers of Holland Park. Conifers are non-flowering trees which bear naked seeds attached to the scales of their cones. Most, but not all, are evergreen. We started with the two pines between the iris fountain and the Dutch Garden. They and the adjacent silver birches are all that is left of the heather garden transplanted from an RBK&C stand at Chelsea which might explain why they are two uncommon species – the Bosnian Pine and the Japanese White Pine. Although both pines they differ in all their details: the number of needles in each bunch, the angle, length and stiffness of the needles, the colour and texture of the bark, the size, shape and colour of the cones. Those who wish to distinguish between similar species have many clues. The walk continued in similar vein, looking at more pines and contrasting species of junipers, cypresses, firs, cedars and redwoods. Holland Park has no monkey puzzle but it does have a young tree from the same family, the Wollemi Pine on the West Lawn. In spite of its name it is not a pine; very similar trees have been found fossilised but living ones were only discovered in a remote gorge near Sydney at the end of the twentieth century. We also had special permission to enter the Yucca Lawn to look at the Incense Cedar with its typical spire shape. We do not often go in there, so it was the first time that Alan had identified the Maritime Pines there. But the real surprise was to find a Wellingtonia there – how could a middle-aged specimen of what the Americans call just The Big Tree have been hiding unnoticed? For those who want to see one close up, there is a newly-planted one near Lord Holland. Thank you, Alan, for an instructive walk with a surprise at the end.